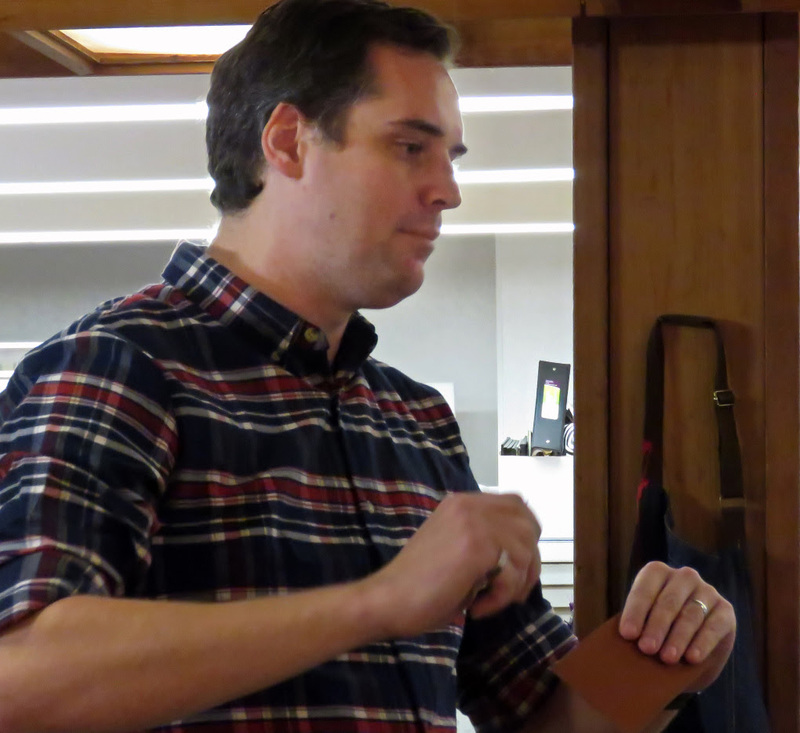 When not on the race course, or running his own business consultancy, or picking up after two small kids, Dan teaches Leatherworking at Marine Mills Folk School and other locations. Dan found he wanted a creative outlet to balance his time in front of a computer, and one thing led to another! 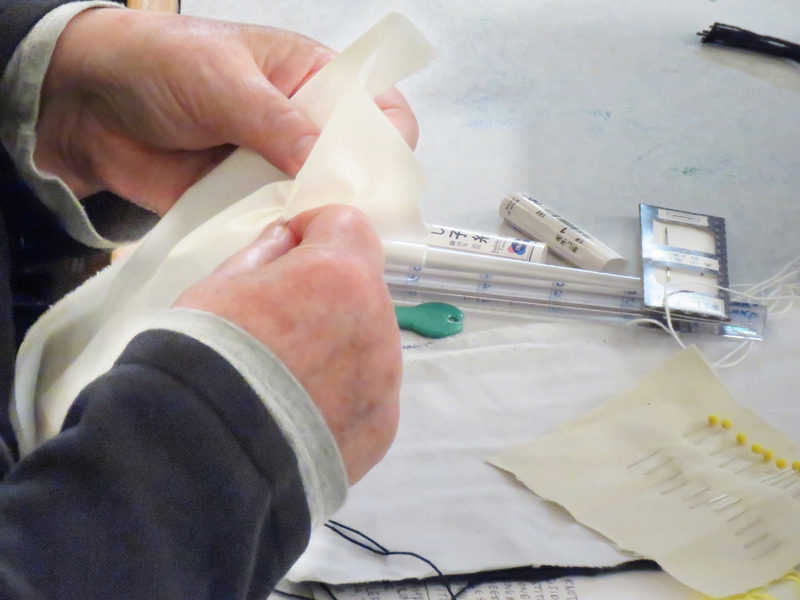 Have you always been interested in traditional crafts and using your hands? My parents were always very supportive of me pursuing artistic endeavors. But they also said I had to have a practical side – hence a degree in business and a minor in studio art. I’ve always collected hobbies, even as a child – I’ve been a photographer, a jeweler, a potter and a painter. Leatherworking might just be the newest hobby, or it might be more since it’s stuck around for years now! What led to your interest in Leatherworking? Two reasons: I wanted a break from staring at a computer for my job, plus I found a leather wallet I wanted but couldn’t afford. I learned the basics from a book plus a lot of trial and error. I should have bought the wallet – it would have been much cheaper in the long run! What about the creative process, and about teaching others, appeals to you? I never expected to be a teacher but I kept getting more requests. It started slow – a few very patient people at a time – but over the last 3 years I’ve taught nearly a thousand people! I have many students who have returned multiple times and some that have even become apprentices – helping me teach larger groups. I hope students who take a class from me will see the pleasure and peace that can come from working with your hands to create something both beautiful and functional. What’s your advice to someone who might be considering taking a class but doesn’t think they have the skill or ability? I’ve taught kids as young as 6 how to work with leather and hand sew. I’ve taught people with one arm (he was on a first date!). People missing an eye, missing fingers, with arthritis, tendonitis, MS and more. I’ve taught people with no artistic ability whatsoever. It doesn’t matter – anyone can learn, everyone can have fun and everyone should experience the joy of making something with their own hands. Where do you look for inspiration? I love the MIA (https://new.artsmia.org/). I go at least once a week to wander and work and observe. They don’t have many pieces incorporating leatherworking, but observing the forms and feeling of other work inspires me to create again. People can always contact me as well – I’m happy to share my leather “cheatsheet” of sources and recommended tools.